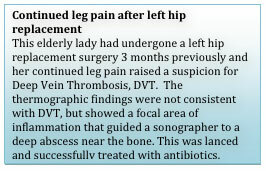 In this May issue we describe other ways to consider utilizing DITI as a preventative screening tool. 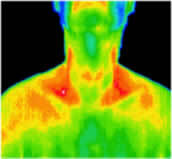 Thermal imaging alerts you to inflammation in an area of the body so early interventions can be taken. Ultimately, decreasing inflammation is better for achieving optimal health and potentially preventing illness. 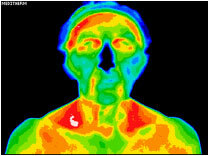 Thermal imaging is one example of practicing “upstream” care. 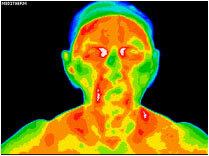 Thermography images heat related to inflammation. It is one way to determine if the chronic inflammation you have been ignoring may be contributing to deleterious effects in your body. Inflammation is a necessary and protective response to injury, an allergen, or infection that poses a threat to immune health. The inflammatory response is driven by the release of chemicals that signals the body to launch an attack on the threat. And then, in perfect synchronicity, the tissues and organs signal the immune system to shut down the assault; the threat is managed and the body is no longer in harm’s way. While we need “short-term” inflammation, if the immune system does not shut off and the system stays “primed” for attack this leads to chronic inflammation. Chronic inflammation is the culprit behind all disease, including heart disease, hypertension, stroke, arthritis, gout and cancer, to name a few. In a reactive medical system, or “downstream” medicine, the doctors are taught to treat the symptoms of the disease, usually with drugs. But many of these diseases can be reversed WITHOUT drugs when you find the root cause for the inflammation and eliminate it. Let’s explore different sources of chronic inflammation. Chronic bacterial, viral, or yeast infections or parasites contribute to inflammation. Foreign bodies activate the immune system to fight the invader. 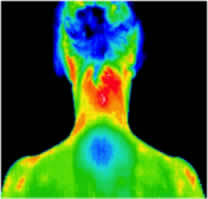 Food is probably the most common type of nefarious agent that contributes to inflammation. Perhaps the one food that has received the most attention lately and contributes to inflammation is, of course, gluten. Gluten is a protein found in wheat-related grains and is now a clear contributor to systemic inflammation. Some clients have even removed ALL grains and sugars from their diet and bake using almond flour, coconut flour, coconut nectar and other grain-free/sugar-free options. 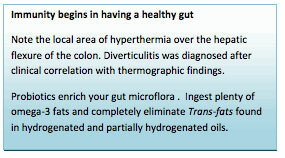 Below is one client who was having trouble with recurrent sinus infections, diminished kidney function, was heading toward diabetes and had no energy. After making significant changes to her diet, her kidney function is now normal, her A1C is within a healthy range and she has more energy. Clearly, her sinus infection had resolved. Any food that launches an inflammatory attack is considered an allergenic food. Some common allergenic foods include wheat, soy, dairy, corn and peanuts. You may notice gut distension or a bloated feeling after eating a certain food and this is a sign that you are sensitive, if not allergic, to that food. Coffee is considered pro-inflammatory because it triggers the release of excess stress hormone, increasing inflammation. If decreasing inflammation is a personal goal for you, you may want to consider eliminating coffee from your diet and adding non-caffeinated teas. 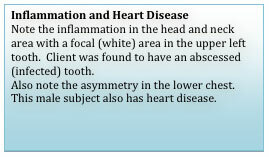 In addition, the quality of the food we buy can contribute to inflammation. Animals traditionally raised feed in open, grassy meadows that then provide us with meats high in omega-3 fats. Cattle that are fed a grain-rich diet (corn) provide us with meat that is laden with omega-6 fatty acids which increases inflammation. Omega-3 fats are protective and anti-inflammatory in nature. Other contaminants in our food supply that contribute to inflammation include insecticides, pesticides and Genetically Modified Organisms (GMOs). These chemicals act as foreign invaders to our immune system which activates all defenses to protect itself, thereby activating the immune system and keeping it stimulated causing chronic inflammation. Overwhelming life stressors or a combination of multiple major stressors and how you manage these certainly can contribute to inflammation. Pressure from your boss, difficult times with your spouse and children, illness/death of a loved one, financial struggles or facing a life-threatening health challenge will certainly tax the “Zen” in any of us. All these stressors, left unchecked, can contribute to inflammation, leading to disease.